A tube formation assay is used to evaluate vascular activity of tumor cells. Francescone III, R. A., Faibish, M., Shao, R. A Matrigel-Based Tube Formation Assay to Assess the Vasculogenic Activity of Tumor Cells. J. Vis. Exp. (55), e3040, doi:10.3791/3040 (2011). Over the past several decades, a tube formation assay using growth factor-reduced Matrigel has been typically employed to demonstrate the angiogenic activity of vascular endothelial cells in vitro1-5. However, recently growing evidence has shown that this assay is not limited to test vascular behavior for endothelial cells. Instead, it also has been used to test the ability of a number of tumor cells to develop a vascular phenotype6-8. This capability was consistent with their vasculogenic behavior identified in xenotransplanted animals, a process known as vasculogenic mimicry (VM)9. There is a multitude of evidence demonstrating that tumor cell-mediated VM plays a vital role in the tumor development, independent of endothelial cell angiogenesis6, 10-13. For example, tumor cells were found to participate in the blood perfused, vascular channel formation in tissue samples from melanoma and glioblastoma patients8, 10, 11. Here, we described this tubular network assay as a useful tool in evaluation of vasculogenic activity of tumor cells. 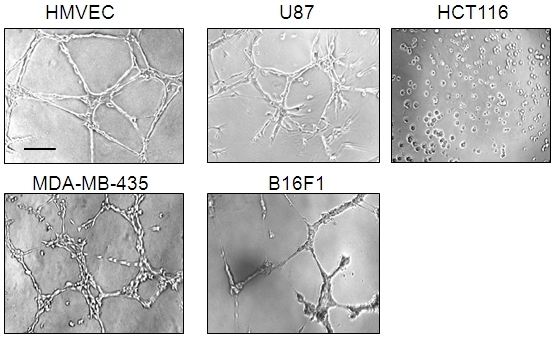 We found that some tumor cell lines such as melanoma B16F1 cells, glioblastoma U87 cells, and breast cancer MDA-MB-435 cells are able to form vascular tubules; but some do not such as colon cancer HCT116 cells. Furthermore, this vascular phenotype is dependent on cell numbers plated on the Matrigel. Therefore, this assay may serve as powerful utility to screen the vascular potential of a variety of cell types including vascular cells, tumor cells as well as other cells. Preparation of tumor cells and microvascular endothelial cells: brain tumor cells such as U87 cells, melanoma cells B16F1, breast cancer MDA-MB-435, and colon cells HCT116 were grown in DMEM supplemented with 10% FBS and penicillin/streptomycin (all from Invitrogen). Endothelial cell line human microvascular endothelial cells (HMVECs) were cultured in EBM2 medium (Lonza) supplemented with 1 μg/ml hydrocortisone and 1 ng/ml epidermal growth factor, 10% FBS and penicillin/streptomycin. Cells were washed with PBS three times and detached with 0.05% trypsin/EDTA (Invitrogen). After centrifugation with 2,000 rpm for 5 min, cell pellets were washed again with PBS. Then, the pelleted cells were counted with a hemocytometer. Matrigel preparation: An aliquot of growth factor-reduced Matrigel (BD Bioscience) was warmed up at room temperature. Before completely thawed, it was transferred onto ice and its liquid was kept on ice for at least 10 min. Then 50 μl of Matrigel was plated to 96-well plates at a horizontal level that allows the Matrigel to distribute evenly, and incubated for 30 min at 37°C. Tube formation: Cells (1-2 x 104) were re-suspended with serum-free DMEM for tumor cells or EBM-2 for endothelial cells, and loaded on the top of the Matrigel. If this assay was used for measuring effects of some agents on tubule development, these agents (stimulators or inhibitors) were added to the serum-free medium. Each conditional group contained 4-6 wells. Image and data analysis: Following incubation at 37°C overnight, each well was analyzed directly under a microscope. If tubules were needed for fixation, 100 μl of 10% formalin saline-based solution was gently added and ten min later, it was ready for analysis. Under a microscope with 10x phase contrast, tubules in each field were imaged and an average of tubules from 3-5 random fields in each well was counted. HMVECs were used as a positive control, as these tubules were developed from clear elongated cell bodies that connect to form polygon network. 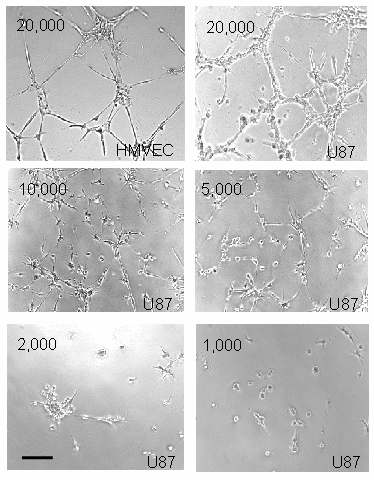 B16F1, U87, and MDA-MB-435 cells developed vascular tubules similar to those formed by HMVECs, but HCT116 cells did not (Figure 1). A cell dose-dependent tube formation was tested in U87 cells. As demonstrated in Figure 2, 10,000 cells formed discontinued tubules. Once the cells were doubled, a solid vascular network was comparable to those seen in HMVECs. In contrast, cells less than 5,000 failed to form a vascular phenotype. Figure 1. Tube formation induced by HMVECs, U87, MDA-MB-435, and B16F1 cells, but not HCT116 cells. All the cells (2 x 104) were loaded on Matrigel and incubated overnight. Tubules were imaged using phase contrast. HMVECs were used as a positive control. A representative of 3-5 fields was shown. Bar: 100 μm. Figure 2. U87 cell-induced tubules in a cell number-dependent manner. Different numbers of U87 cells as indicated in the corners were used for tube formation. HMVECs were used for a positive control. Bar: 100 mm. In order for this assay to succeed, the quality of Matrigel should be tested first. A small sample may be obtained from BD Bioscience to pre-run the assay using HMVECs. Different batch products may display dissimilar qualities in which some lots do not provide an optimal condition for tube formation. Second, any bubbles should be avoided when an aliquot of Matrigel is loaded in 96-well plates, because bubbles can disrupt tubule formation. If tiny bubbles are found in a well, the Matrigel can be immediately moved back to the original Matrigel tubes which should be kept on ice during the experiment. In addition, tested cells should be maintained in a growth rate at a log phase. When any cultured conditions indicating slow growth of the cells occur, they should be replaced with healthy cells. Finally, the analysis of tubes under a microscope should be no longer than one hour if the tubes are not fixed because decreased temperature (room temperature) could affect tube formation. The whole assay should be completed within 24 hours to avoid disruption of tubular structure induced by cell death. It is well known that the tube formation is characterized by multiple cellular-activated processes including cell migration, cell-cell adhesion, survival, and apoptosis. For example, cell migration and cell-cell adhesion are noticeable during the tube development. After 24 hr, however, significant cell apoptosis takes place as discontinued network is increasingly observed. This event occurs in both endothelial cell and tumor cell-derived tube formation. It is emerging that this assay is critical for evaluating tumor cell vasculogenic activity in vitro, the event that is independent of endothelial cell-associated angiogenesis. Here, we have shown that melanoma cell line B16F1 and breast cancer line MDA-MB-435 developed vascular networks on Matrigel, consistent with vasculogenic behavior of these types of tumors in human as well as in animal models14-17. Although the failure to develop a vascular phenotype by HCT116 cells on Matrigel is mechanistically unknown, it is speculated that this vascular property may be tumor cell type dependent. It would be interesting to know if HCT116 cells lack the ability to generate VM in vivo as compared with B16F1 and MDA-MB-435 cells. Therefore, establishment of this assay is of paramount importance in the study of cancer biology, vascular biology as well as drug screening. This work was supported by NCI R01 CA120659 (RS). Shao, R., Guo, X. Human microvascular endothelial cells immortalized with human telomerase catalytic protein: a model for the study of in vitro angiogenesis. Biochemical & Biophysical Research Communications. 321, 788-794 (2004). Ribeiro, M. J. Hemostatic properties of the SV-40 transfected human microvascular endothelial cell line (HMEC-1). A representative in vitro model for microvascular endothelium. Thromb Res. 79, 153-1561 (1995). Ades, E. W. HMEC-1: establishment of an immortalized human microvascular endothelial cell line. J Invest Dermatol. 99, 683-690 (1992). Shao, R. Acquired expression of periostin by human breast cancers promotes tumor angiogenesis through up-regulation of vascular endothelial growth factor receptor 2 expression. Molecular & Cellular Biology. 24, 3992-4003 (2004). Shao, R. YKL-40, a secreted glycoprotein, promotes tumor angiogenesis. Oncogene. 28, 4456-4468 (2009). Basu, G. D. A novel role for cyclooxygenase-2 in regulating vascular channel formation by human breast cancer cells. Breast Cancer Research. 8, R69-R69 (2006). Scavelli, C. Vasculogenic mimicry by bone marrow macrophages in patients with multiple myeloma. Oncogene. 27, 663-674 (2008). El Hallani, S. A new alternative mechanism in glioblastoma vascularization: tubular vasculogenic mimicry. Brain. 133, 973-982 (2010). Maniotis, A. J. Vascular channel formation by human melanoma cells in vivo and in vitro: vasculogenic mimicry. American Journal of Pathology. 155, 739-752 (1999). Hendrix, M. J., Seftor, E. A., Hess, A. R., Seftor, R. E. Vasculogenic mimicry and tumour-cell plasticity: lessons from melanoma. Nature Reviews Cancer. 3, 411-421 (2003). Folberg, R. Tumor cell plasticity in uveal melanoma: microenvironment directed dampening of the invasive and metastatic genotype and phenotype accompanies the generation of vasculogenic mimicry patterns. American Journal of Pathology. 169, 1376-1389 (2006). Liu, C. Prostate-specific membrane antigen directed selective thrombotic infarction of tumors. Cancer Research. 62, 5470-5475 (2002). Sood, A. K. The clinical significance of tumor cell-lined vasculature in ovarian carcinoma: implications for anti-vasculogenic therapy. Cancer Biology & Therapy. 1, 661-664 (2002). Shirakawa, K. Hemodynamics in vasculogenic mimicry and angiogenesis of inflammatory breast cancer xenograft. Cancer Research. 62, 560-566 (2002). Ruf, W. Differential role of tissue factor pathway inhibitors 1 and 2 in melanoma vasculogenic mimicry. Cancer Research. 63, 5381-5389 (2003). Seftor, R. E. Cooperative interactions of laminin 5 gamma2 chain, matrix metalloproteinase-2, and membrane type-1-matrix/metalloproteinase are required for mimicry of embryonic vasculogenesis by aggressive melanoma. Cancer Research. 61, 6322-6327 (2001). Shirakawa, K. Vasculogenic mimicry and pseudo-comedo formation in breast cancer. International Journal of Cancer. 99, 821-828 (2002).